Here at Aural Archipelago, I try to keep my ears open. These pages are open to any musical format that fascinates me, from solo instrumentals to a capella choirs, from instrumental combos featuring Casio keyboards to solo vocals. Still, it doesn’t take longer scrolling through the archives to see I’m a sucker for the Unique Instrument. Some favorites are the bundengan, a duck herder’s shelter-turned-lamellophone-zither; the gule gending, a cotton candy receptacle mated with a steelpan; and the gong tanah, a kind of huge one-string zither using the earth as a resonator. I try not to just fetishize the peculiarity of form, though - it’s too easy to shallowly holler, “look at this weird instrument!” and then move on. For one thing, while I embrace “weird” not as a pejorative but as a marker of singular creativity, an instrument that is unusual to me may be perfectly normal to a local - something like the gule gending is (or was, as times change) a banal bit player in the fabric of Lombok village life. But beyond this, these instruments are not just amazing for their eye-catching shape or organological oddness but also for the immaterial cloud of history, cultural context, and mythology that surround them. The bundengan, for example, is not just a fantastically shaped zither but a fascinating example of rural Javanese music-making that is decidedly non-performative, an instrument designed for the enjoyment of the player and no one else. The gule gending is not just an awesome proto-handpan but also a window into the way music and commerce in Indonesia are intertwined. I could go on. Some of the most delightful moments in my time making Aural Archipelago are those times I’ve met with Indonesian instrument makers who are actively bringing brilliant new musical tools into the world, fresh new creations just aching to be wrapped in myth like their ancient cousins. I’m talking about people like Wukir, one half of the famous Jogja duo Senyawa, a guy who delights in creating profoundly new sounds out of homemade instruments like the bambu wukir, a beast of an instrument which takes cues from tube zithers like the sasandu but takes them into the avante-garde. I’m talking about people like Akim, my old neighbor in Bandung: a blacksmith-turned-bamboo instrument maestro pumping out fascinating new creations from his workshop in Dago, the kind of guy who took one look at Arrington de Dionyso’s PVC-pipe bromiophone and thought “I can make that out of bamboo!,” then did exactly that. I’m talking about a guy like Predi, a gandang sarunai artisan from South Solok who I met this past October. I originally met Predi in the hopes of learning more about gandang sarunai, as he is one of the last makers and maestros of that genre’s gandang barrel drum. Sitting in Predi’s living room, we talked about gandang for a bit, but soon we were both distracted: Predi had brought out a pile of other instruments he’d built out of bamboo, spreading them out on his coffee table seductively. I, too, spread out my instrument collection: my trusty old kalimba and a sack full of mouth harps, Javanese rinding, Sasak selober, and a Vietnamese dan moi amongst them. Predi’s neighbor, Pak Cican, tries out my os komuz jaw harp. Soon enough we were both fully geeking out, getting high on the buzz of musical discovery. Predi was turning my kalimba over and over in his hands, speculating how he could make one himself, asking me about where it was from, what was the music like, where could I find a bracket like that? I, in turn, was fawning over his homemade instruments, wonders such as the saluang panjang, an open, extra-long bamboo flute unique to this valley. Amongst Predi’s collection were instruments he’d invented himself, variations on old Minang musical technology, so new as to not yet have a name. Inspired, I asked Predi if I could record him playing some of the instruments in his collection. Sure, he said, and started blowing away right there behind the coffee table. It wasn’t perfect, though: his house was an almost empty concrete shell inches from a busy thoroughfare. Trucks and motorbikes buzzed past, their tailpipes blasting sound that echoed through the space, obscuring the music in an industrial haze. Could we go someplace quiet, I asked? A minute later I was following Predi through the rice paddies and vegetable crops behind his house, treading carefully on the raised muddy ridges between them like a tightrope walker. We soon reached a bamboo and scrap metal hut overlooking a verdant green panorama of sparkling rice fields and distant hills. The space was just big enough for Predi, Datuak, and I, so we crawled in and enjoyed the view for a bit, our ears refreshed by the distance from that buzzing road. Soon, Predi launched into a show and tell of some of the instruments he’d made. This post is a translation of that moment: a brief but satisfying dive into the enigmatic world of Minang sound-making from the perspective of a music-loving artisan. First, genggong karet. As soon as I’d pulled out my collection of mouth harps, Predi’s eyes had widened in recognition: genggong! He was soon digging through my pile of instruments, pushing through the indigenous bamboo and wooden harps to get to the outlier of my collection: a temir komuz I’d picked up at a market in Bishkek, Kyrgyzstan. That instrument has the shape most westerners would think of as a jew’s harp: a springy metal tongue attached to a frame designed to be placed against the teeth. Predi began to close his eyes in nostalgia, telling me how when he was a child, these things were everywhere. People called them genggong, a common name for mouth and jaw harps across the archipelago. You could buy them at the market, Predi told me, a rare thing in a place where people tend to make instruments themselves (the instruments were likely copies of instruments brought over by foreign traders - maybe the Dutch, maybe the Indians?). They were cheap, though, and easy enough to play, so kids loved them: young boys and girls would flirt with each other by playing each other tunes. 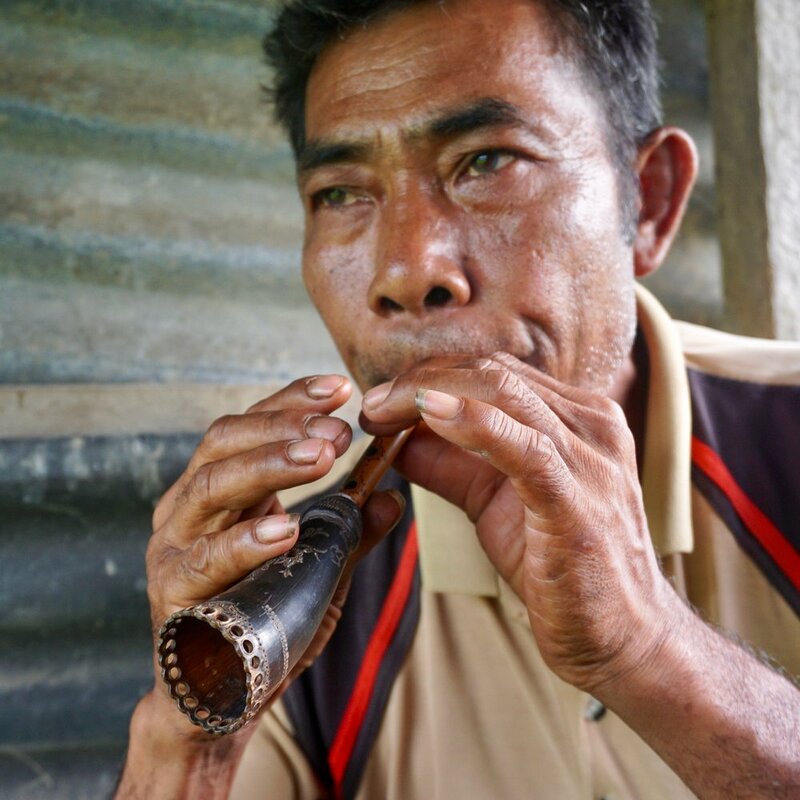 The metallic genggong are, as far as I can tell, essentially extinct in West Sumatra: I met plenty of people like Predi who remembered playing them as youth back in the 60’s and 70’s, but around that time they soon fell out of favor, and people simply threw them away. 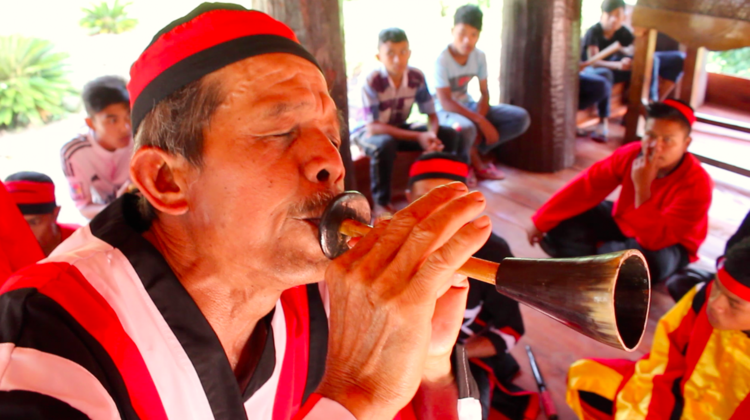 With no more instruments around, the once-ubiquitous genggong lives on only in memory. Predi had a go at playing my timer komuz, but found it difficult: he hadn’t played in decades, and the shape was different than what he was used to. Wait, he said, there’s another way: somebody fetch me a rubber band! One of Predi’s kids ran off and returned with a typical rubber band, the kind you’d wrap a newspaper in. Predi tore the band (called karet, or “rubber” in Indonesian, karai in Minang) so it was like a long, flexible string. Stretching the green rubber between his two hands, he placed one end between his lips, flicking the other end with the index finger of his outstretched hand. The buzz of the string entered his mouth and emerged with a quiet tonal clarity, overtones shaped by his tongue, lips, and throat. Predi stretched the rubber longer, the fundamental tone sliding upward as it became more taut, overtones sliding upwards too. We called his genggong karet, Predi told me, or simply karai. When he was a kid, Predi would play the rubber band in idle moments, in quiet places, like when he was drifting off to sleep in bed. It was such a quiet thing, it wasn’t really something you could share, anyway. People shared it nonetheless - the trick of playing Minang tunes on genggong karet at some point spread across the Minang world: I read about it first in Jennifer Fraser’s book about talempong, Gongs and Pop Songs; in it, Fraser mentions that women in Unggan (far away from Predi’s place, in the highlands bordering Riau) would practice talempong melodies on the rubber band. It couldn’t be an incredibly ancient practice - how long have rubber bands been around? - but it was once as widespread as those genggong they sold in the markets, maybe even moreso. What some might regard as a child’s plaything is, in many ways, a surprisingly sophisticated little trick of music making. In organological terms, the genggong karet is closer to a musical bow than a mouth harp. Both use the same principal - a plucked string placed between the lips, the overtones manipulated by the player’s mouth. Both play with changing the fundamental pitch, the mouth bow by stopping the string with the player’s hand, the genggong karet by stretching it to be more or less taut. Mouth bows are found across Africa in countless forms, but they’re almost unheard of in Southeast Asia - in Indonesia, I’ve only heard of them in Timor, where they’re called knobe khabetas, a tradition related to the Timorese mouth harp, or knobe oh. It’s a cool thing to think about, then, the Minangkabau inventing a kind of modern variation on the mouthbow from the detritus of an emerging industrial society. Predi’s playing here is just a demonstration: he hadn’t played for decades, so he was digging into some deep corners of his brain to unleash long dormant muscle memory. Remembering the songs, though, was easy enough - there was no special repertoire for genggong karet, he explained: we’d just play the songs we heard around us. Here, Predi plays for us a dendang saluang melody, a tune based on the melodic sung poetry often accompanying saluang flute. Next in Predi’s show and tell was his pupuik sarunai, also known as sarunai bambu. Pupuik is the name for any reed instrument in Minang, a family tracing back to the most ancient of instruments, the pupuik batang padi, or rice stalk aerophone. I talked about this a little bit in my post on gandang sarunai: it was once common to make a buzzing reed out of the stalk of the rice plant, modifying it with a large bell made from a coiled palm leaf. These are tough to play though, and are inherently disposable - the instrument often simply falls apart soon after making it. Another variation, then, is the bamboo variety, or pupuik sarunai. It’s technically a kind of clarinet, as a single reed is carved from the side of the sarunai itself. In Predi’s version, this reed is detachable: you can stuff it into the larger bamboo body, the length of which is lined with four fingerholes. At the end of the sarunai is a bell made from the horn of a water buffalo: Predi’s is beautifully ornamented with abstract motifs or ukiran, handcarved and melted into the horn. You can find simple clarinets like this across Indonesia - some of the earliest toleat in West Java may have taken this form, and I’ve recorded another variety, sarune, once before in Mandailing North Sumatra. In South Solok, where I recorded with Predi, the pupuik sarunai can be played solo, just for amusement while hanging out in the fields. It’s also used in a more performative context, as part of a gandang sarunai ensemble or as accompaniment in a talempong pacik group. Predi played solo with masterful circular breathing (salisiah angok), sometimes pushing on the reed with his lips to get colorful bends, extending the narrow melodic range just a little bit. His playing had a beautiful, piercing sound with a confident melodicism that reminded me of the wooden sarunai playing on the South Coast. The piece he played was “Lambung Batu,” a kind of opening song played to signal the beginning of a performance of either gandang sarunai or randai, a traditional Minang theater form. Finally, Predi wowed me with a creation all his own: seemingly a take on the pupik sarunai, he hadn’t even thought of a name yet. The instrument which I came to call sarunai panjang (long sarunai) takes the sarunai’s single reed technology and extends its range into a smooth, sax-like tenor. The instrument is simply one long piece of narrow bamboo, open on both ends, with a single reed carved out of one end and four fingerholes lined equidistantly down its lower end. Predi plays it with circular breathing just as with pupuik sarunai, and the repertoire is equally free as the more traditional pupuik sarunai - mostly Minang folk tunes not specifically tied to any one instrument. Predi surprised me, though, with his selection when I asked him to play in the hut: he was playing a lagu kalason, or bus horn melody, “Gumarang.” I’ll post more about that soon, but to make a long story short, buses across West Sumatra once had musical horns played manually by a musician, a tukang kalason, in the passenger seat. “Gumarang” was one of the famous bus lines, a bus whose tunes became so popular that they put out cassettes back in the 70’s and 80’s with their bus horn melodies. Predi, meanwhile, had taken inspiration from the pupuik sarunai and shaped it into this new creature. Are we witnessing, here, the birth of a new musical tradition? Every tradition, after all, has to start somewhere. It will be interesting to see what life is blown into his creation, whether it will be entered into the canon of classic Minang instruments, or continue to live on only in Predi’s workshop. Regardless, I want to enshrine it here in these pages as a beautiful new voice in the spectrum of Minang sounds, another member of that great family of Unique Instruments that I love so much.